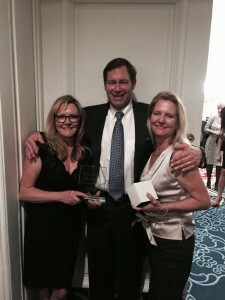 Cornerstone Homes Wins at 2015 MAME Awards! Cornerstone Homes recently won two coveted awards from the Homebuilder’s Association of Richmond (HBAR) Sales & Marketing Council’s “Marketing Excellence Awards”. The 2015 SMC MAME Awards Dinner was held on March 3, 2016 at the Jefferson Hotel. The MAME Awards pays tribute to superior sales and marketing achievements by individual professionals, homebuilders, developers, remodelers, real estate agents, and associates; and we’re honored to have been selected as winners in the following categories! Award details include marketing strategies highlighting each of the the wonderful things that make a Cornerstone Homes community unique, and the reasons why our homeowners love living here! Highlighted events included our Groundbreaking, Hard Hat Tour, Model Grand Opening and more! Follow us on Facebook and join our mailing list to stay up to date on the latest happenings at Cornerstone Homes. We're proud to announce that Ginny was recognized by the HBA for sales excellence Ginny closed well over $3 Million in sales in 2015 awarding her the Gold Award.